Introduction: Why Should You Trust JFA? What Makes a Good Pro-Life Event? Does your event create a debate about abortion? Does your event turn the debate into a dialogue? Is your event activating, training, or connecting pro-life advocates? Invite a JFA Speaker to Prepare You for One-to-One Conversations. Why Host a JFA Speaker? Invite the JFA Training Program, including a Large Outreach Event. Why Invite JFA to Your Campus? Turn any Pro-Life Outreach Event into a Dialogue Event. To see this content as one continuous page, click here. Can JFA help you? Don’t take our word for it. See “How JFA Helped Me Reach My Campus” for Meredith’s detailed description of partnering with JFA in 2015 and 2016. Camille invited JFA to CSU in 2008 and volunteered with JFA on other campuses in the years following. Camille now serves as the Pacific Southwest Regional Coordinator for Students for Life of America. Jinny invited JFA to Pasadena City College in Southern California in 2009 and 2010. Read how Jinny helped a friend in crisis and helped save a child’s life afterwards. Porsche wrote this reflection in 2006 after volunteering with JFA through her high school. She later invited JFA to her college, Middle Tennessee State University, in 2010. Learn more about JFA from the perspectives of other students, pro-life leaders, church leaders, teachers, and school administrators. This article is one of a series entitled, Conversations Change Campuses. To view the entire series, see below or click here. At JFA, we talk a lot about our twin passions: creating conversations that change hearts and minds and equipping pro-life advocates to create those conversations. To accomplish these goals, we focus on creating large-format outreach events that within a two-day or three-day period cause hundreds and sometimes thousands of pro-choice (and pro-life!) advocates to stop so that our staff and volunteers can engage them in meaningful conversation about abortion. In this guide you’ll see these passions coming through. The questions we suggest you ask of any pro-life activity you’re considering are the questions we ask when we decide what events are worth trying to accomplish with our limited time and money. As a pro-life student organization, we know it’s likely you have the same constraints of time and money that we experience, and probably to a greater degree. Before you start asking questions of your activity ideas, though, we suggest defining your mission. How would you describe the purpose of your club? Is it to stop abortion on your campus? Is it to make an impact beyond your campus on whether abortion is legal? Is it to help women in one of the most difficult times of their lives, when they find themselves pregnant but don’t want to be? Defining your mission will help you evaluate which activities are worth doing – those that accomplish your mission best. Should you host a speaker? Should you create a conference? Should you hold a bake sale? Should you protest a pro-abortion philosopher on campus? Should you invite an organization to bring an outreach event? It depends…on your mission. Let me elaborate for a moment on that middle phrase. We are aiming to “make abortion unthinkable for millions,” meaning, “for a strong majority in the United States.” That means, roughly, that we’re attempting to make abortion just as unthinkable as slavery. Why unthinkable? Ultimately, we want to see the unborn treated as the equal human beings they are, intrinsically valuable ends in themselves. For something so central as protecting humans from violence, it makes sense that the law should outlaw abortion. Yet abortion is one of the most firmly entrenched rights in American law…right now. To see public policy change, then, it’s going to be necessary first to cause public opinion to change. We are seeking to change how people think and feel about abortion to make it possible that the unborn could ultimately be protected in law and loved as equals. JFA focuses squarely (and with all of our energy) on changing public opinion – changing how people feel and think about abortion. We believe that many activities might contribute to this, but dialogue makes a more lasting impact on public opinion than any other activity. By dialogue, we mean a conversation that’s filled with listening to understand, asking questions with an open heart, and finding common ground. It’s also a conversation in which the facts about the unborn and abortion, including the visual facts, are fully present and accounted for. We’ve seen over and over that when we go find pro-choice advocates in their world, rather than expecting them to come to ours, and when we treat them respectfully, in many cases they allow us to challenge their views. In many cases, they are open to changing their minds, especially when we show a similar openness to being mistaken about some of our beliefs. This is why “one person at a time” is important to us. We believe we can create a strong majority of people who see abortion as an evil similar to slavery, not primarily through mass media or social media campaigns, but primarily through conversations that give people space to rethink, free of the pressure to defend their turf or their honor. That’s the value of dialogue – when done right, it values both the truth about the unborn’s humanity and the truth about the humanity of the person with whom we’re speaking. If what we’ve said above is true, dialogue with pro-choice advocates, and dialogue with a whole lot of them, is necessary for bringing justice to unborn children. So how can we make the most of our limited time and money to bring about the most conversations with pro-choice advocates? That’s the question that we at JFA have wrestled with for years. It’s what led us to emphasize the “train thousands” part of our mission statement. We know that if thousands and thousands of pro-life advocates are creating conversations about abortion every week or every month, together we can change millions. So, we’ve now come full circle to JFA’s mission statement (training thousands to make abortion unthinkable for millions, one person at a time) and the twin passions that explain our mission (creating a different kind of conversation with millions of pro-choice advocates by training thousands of pro-life advocates to have those conversations). So, the question is before you: Are you wanting to change the way people feel and think about abortion in order to see public opinion change – on your campus and beyond? Are you wanting to equip pro-life advocates in your community to create the conversations that help people change? If you see these goals as part of your mission, then we invite you to consider the following questions whenever you’re planning your pro-life events or deciding which events to do. 2: What Makes a Good Pro-Life Event? Is your event captured in the newspaper? Is there a buzz? Is it talked about in classes? Is it visually compelling? Does it intrigue the viewer? Does your event make unborn children and abortion almost impossible to ignore? Are individual members of the community rethinking their views on abortion? Are you talking to people who disagree (pro-choice or non-religious)? Are you building common ground? Are you asking good questions and listening with humility? See JFA Conversations (@7conversations) on Twitter for examples. Are you offering compelling reasons? See Explore All Resources for help. Are you collecting email addresses from those who disagree and responding personally? Are you using the activity to find and/or train new pro-life advocates? Are you using your event to train other groups (religious or non-religious) on campus? Are you capitalizing on momentum by planning a new event? Speakers: Get to know Our Team. Presentation Content: Learn about Speakers and Presentations. How Much Will it Cost? We will give you a suggested honorarium for making a speaking event happen, but the honorarium is somewhat negotiable. Stories from JFA Speakers: To read some of the stories our speakers share with audiences, see Stories and Dialogue Examples. Note: If we can’t send a speaker, we will be happy to suggest another speaker who shares JFA’s concern for balancing love and truth throughout every presentation and conversation. Contact us at jfa@jfaweb.org or 316-683-6426. Our experienced dialogue artists are also mentors who work alongside you. We train your club and community using a “Seat Work and Feet Work” approach. Our mentors start by personally leading you through an interactive seminar that prepares you for creating conversations that change hearts and minds. Then those same mentors join you for the campus outreach event. Through this process you can watch your mentor in conversation and get feedback from your mentor on conversations you are having. Our outreach events draw lots of people to consider joining your club during just the 2-3 days we are on campus. During the events, we collect names and pass them on to you. Our outreach events give your club something concrete and major to focus on for your year. This shouldn’t be your only dialogue-focused outreach event, but if you can only do one outreach event, why not make it a big one? Some JFA outreach events are big enough to allow 40-80 volunteers to create conversations in one day on campus. Consider inviting pro-life clubs from nearby universities to join your club for the JFA events. It’s exciting to work together to change hearts and minds. Abortion will be a major topic of discussion on campus while JFA is on campus and afterwards. You’ll have more conversation opportunities than you’ll know what to do with. We will give you activities you can do without us after we leave campus. We will personally mentor you through the process while we’re on your campus, and we’ll continue to pray for you and encourage you afterwards. See “Introduction: Why Should I Trust JFA?” to hear from other club leaders about their experiences with JFA. Learn More about JFA’s Approach to Training: See JFA's Flagship Dialogue Training page for more information about our flagship training program, which includes an interactive seminar (“Seat Work”) and outreach event (“Feet Work“”). Learn More about JFA’s Campus Outreach Events: See JFA's Campus Exhibit Outreach Events page for more information about our campus exhibit outreach events, which are essential to our flagship training program. Read Real JFA Conversations in Dialogue Form: For conversation stories from JFA outreach events, see Dialogue Examples. How Much Will it Cost? We will give you a suggested honorarium for making this event happen, but the honorarium is somewhat negotiable. Don’t let the fear of cost deter you from contacting Justice For All to explore what’s possible in terms of bringing JFA to your campus. In some cases, we can find supporters to fund an event. In other cases, we can help you find funding you didn’t know was available. Not finding time on the calendar or feeling ready to invite a JFA speaker or JFA's Training Program? The following free resources can help. “Abortion: From Debate to Dialogue” Interactive Guide: This is the same tool JFA trainers use in our workshops and seminars to teach people to dialogue. Focus on Activities 1-7 in Chapter 1 (pp. 1-32). Just fill out this form and JFA will send you the entire Interactive Guide, including permission to copy the guide for small groups. “Learn at Home” Program: Give your club the basics in just one hour using JFA’s “Learn at Home” program. This includes four fifteen-minute exercises you and your club can do together, including planning your first/next conversation. You can access an online version on a smartphone or web browser, and you can also request printed materials to be sent to you. Common Ground Without Compromise: Steve Wagner’s book is centered around 25 questions you can ask in order to create dialogue on abortion. It is available for free at www.commongroundbook.com. JFA Online Resources: Explore JFA’s extensive online resources at our Explore All Resources page. “Equipped for Life” Course: Our friends at the Equal Rights Institute (ERI) have created a wonderful online course your club can use to get equipped for conversations about abortion. See www.equippedcourse.com to learn about it or to subscribe to the course. Scholarships may be available, so be sure to check here for more details. Note: You might want to read “1: Before Your Club Starts Choosing Pro-Life Activities” and “2: What Makes a Good Pro-Life Event?” first. 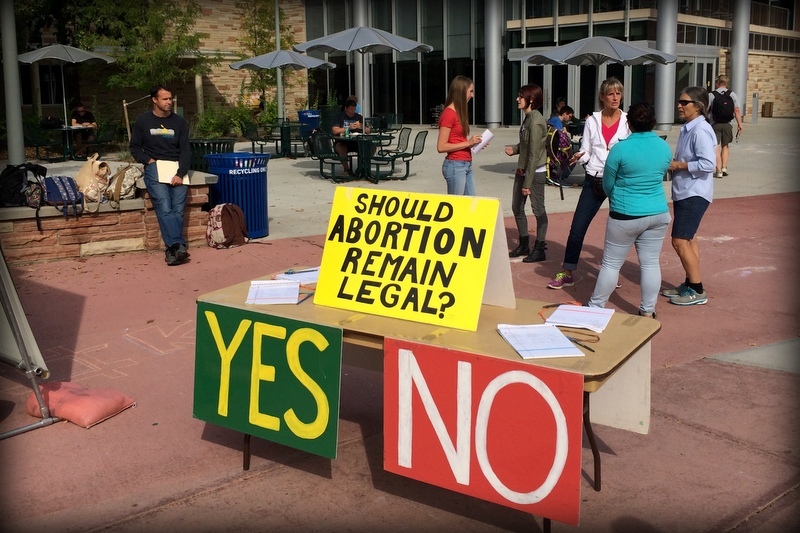 Create a dialogue about abortion in a highly trafficked area of a college campus. Learn about student attitudes toward abortion and start conversations that change minds. Gain email addresses of students interested in the student group. Gain email addresses of students who disagree with you, to continue the conversation. Apply to the appropriate office for permission to set up a table in your selected area. Inform the administration of your start time, end time, and materials you’ll be giving away. Request a table or purchase your own folding table for this and future events. Plan to spend at least two hours in preparation. One hour: Use the practice dialogues in “ADD Interactive Guide, Activity 11: The Poll Table” to prepare to use the "Should Abortion Remain Legal?" poll table to create great conversations. For this, plan a meeting of 1-2 hours. One hour may be all you need here. Or, make this a double-sided table (two directions of traffic) by prepping twice as many signs. See photos below for ideas on making the table double-sided! We use fat Sharpie markers and paint pens to make these signs. We laminate these signs or, at least, we put packing tape on the edges, so that when we tape the signs to the table or to each other we aren’t taping directly on the sign (which would damage the sign later in the day when we take down). One pad of paper with labels on the tops of EACH page (prep 3-5 pieces of paper per pad). Or, prep two pads per side to make this a double-sided table (two directions of traffic). Write “Yes” at the top of one pad. Put a place for NAME, EMAIL (for results of poll), and WHY? Write “NO” at the top of the other with NAME, EMAIL (for results of poll), and WHY? Use the Justice For All Brochure and JFA smart phone resources which provide links to fetal development and abortion images. Two people should be present at the table at all times. Four people at one time can have plenty to do, though, since you’ll probably have about 1 person each minute signing the poll in a heavily-trafficked area at lunch time. So, if you start a conversation with one of those people that takes 30 minutes, and another club member starts a conversation with the next person, you can see that even if some people aren’t interested in conversation, you can generate more conversations than four people can handle. Note, though, that there’s a saturation point at which too many conversations happening at the table may impede traffic, and then you may be asked by administration to change something so that traffic can flow. We tend to think a crowd discussing abortion is a good thing, but we also think it’s important to respect the administration’s reasonable concerns about student safety. Obviously, if your club is a secular or non-theistic club, you won’t be drawn to this item, so feel free to skip it if it doesn’t apply to you. You can still let JFA know you’re doing a poll table, and we’ll encourage you! If your club thinks it is a good idea, we suggest each club member use email or Facebook (or other medium) to ask a few friends to be praying during the time you’ve set aside for outreach. We believe that good arguments and good dialogue skills are important tools, but that ultimately God changes minds and hearts by his Spirit. Meet to pray and set up materials 30 minutes in advance. Suggested minimum club members: 2 at any one time. After the event, first, tally up the poll. You’ll send this tally to all of the email addresses you collected. You’ll have lots of email addresses on the “No” and “Yes” sides. You can’t assume all of the “No” respondents have the exact same views on abortion that you do, and you can’t assume the “Yes” respondents don’t agree with you on anything. For the “No” respondents, send the results of the poll and 1-4 sentences about your club, including the next meeting time, the mission of your club, and why someone should consider coming to a meeting. We suggest including what you’ll equip them to do if they come to a club meeting. Make sure to give contact information for the club (email address, Facebook page, phone number) so they can get questions answered. Suggestion: In this email or in a follow-up, perhaps ask a specific question such as, “Would you like to be involved in pro-life activities on campus?” That way, the person sending the emails can get immediate feedback on people who are clearly interested. We’ve found this helpful for following up with students. They seem more likely to respond if they are asked something directly. We’ve found the “direct question” most helpful if we’re sending to a blind list of emails and we want to know who would want to be involved. For the “Yes” respondents, send them the results of the poll, and an invitation to dialogue further at the poll table in the future (or give a contact email for the club in case they want to have further conversation). Let JFA know how your event went by emailing or calling your contact at JFA, by posting to Facebook (tag JFA’s Facebook Page), or by filling out our “Share Your JFA Story” form. Surveys: JFA staff and volunteers often use surveys to start conversations during our campus outreach events. To learn more about our surveys, learn how to use them at your event, and to request copies contact JFA at 316-683-6426 or jfa@jfaweb.org. Negatives: Maximum of two people signing on each side of poll at one time. Positives: Gives a club an easy way to capture email addresses (send the results of poll with invitation to join club email list, come to a club event, etc). Substitute popsicle sticks for pads of paper. People write their reason on the popsicle stick and push the stick into the foam board. Some people do this with a lot of gusto! Negatives: Doesn’t give you an easy way to capture email addresses. Positives: Multiple people can register their opinion at once. Questions for JFA about Outreach Events? Leave a Comment Here! 7: Turn any Pro-Life Outreach Event into a Dialogue Event. VIDEO: Steve Wagner, Josh Brahm, and Gabi Vehrs discuss several common pro-life outreach activities. Questions about Pro-Life Outreach Events? Leave a Comment Here!